It’s State Fair season. Winter is coming. The beach days are over. What does all this mean? Well, naturally, it means it’s time to fire up the frying oil, chop the potatoes for fries, and break out the napkins, cause National Greasy Foods Day is here. It’s the food we all hate to love. A dripping pizza, deep fried chicken, crunchy potato chips, glistening bacon, and more. We know it’s unhealthy, but that doesn’t stop us from guzzling these foods by the gallon. And now, we have a day dedicated solely to eating these forbidden fruits. On October 25, you don’t have to feel guilty about eating greasy foods, but are actually encouraged. Greasy foods are those that are cooked with some form of oil. The type of oil used can have an effect on the nutrition — or lack thereof — of certain foods, and also at what temperature it will be cooked. This National Greasy Foods Day, see what else you can learn about one of our greatest indulgences. 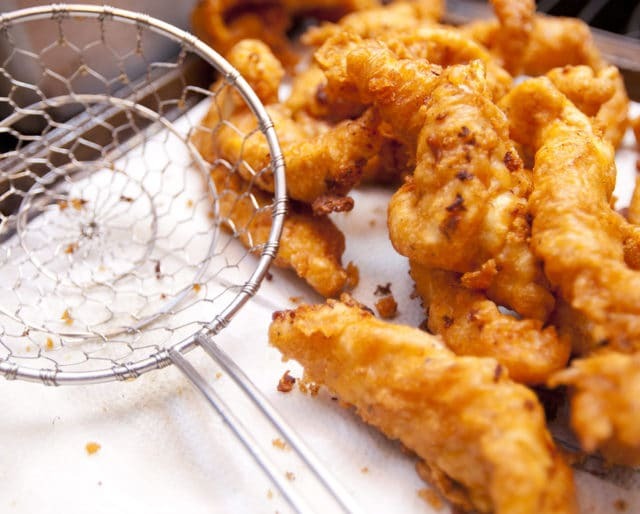 There are very few things in this world one can’t actually fry, and we dare you to try to find them. Get together with your friends to see what zany creations you can make using a deep pot, cooking oil of your choice, and anything you want to batter up and fry. Have a competition to see who can make the best creation, or at the very least, award a “most creative” prize. Burger restaurants and diners aren’t known for the health benefits of their food, but no matter. Head to your favorite local grease bucket and load up on your favorite burgers, fries, chips, chicken fingers, and anything else you choose. You’ll be supporting local businesses, too. For many, pizza is a dish strictly reserved for take out, delivery, or in-restaurant dining. But the reality is it’s really not hard to make a cheesy, bubbling, greasy pizza in your very own oven. It requires a few different ingredients and a little bit of time, but with practice, you can start creating your own recipes to use on any day. One of the perks of making or eating greasy food is that it’s so simple to cook. Fries are simply cut potatoes, oil, and whatever seasonings you prefer. Bacon can even be cooked in the oven, keeping the mess low, while fried foods only require one additional step. So when food is delicious and easy to prepare, why not cook it? While there is no specific evidence, scientists believe our ancestors must have started cooking with oil from animal fats around the same time they started experimenting with fire, around 250,000 years ago. That’s a lot of time to perfect the ideal fried chicken recipe. While fatty foods certainly wouldn’t make your doctor’s list of recommended eats, for a single day, you can indulge guilt-free on whatever greasy food you like best. Just remember it’s for a single day, and don’t make a habit it out of it. Then, your doctor will have a right to be frustrated with you.